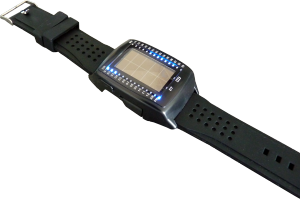 Another amazing product from POWERplus, the PowerbankWatch. The PowerbankWatch is an USB-Solar powered powerbank with watch in one product. Now you always wear extra power with you in case your mobile phone battery runs out of power. The PowerbankWatch can be charged by USB (USB charging cable included) and the battery will keep full power during time by the integrated amorphous solar cell. Displays time and date using binary LED technology.